It would have to be this one. I think there is a clone right next to you too. (and I think I have a similar photo---glasses and all). . . I had those same glasses, but I looked more like Howdy Doody in them. 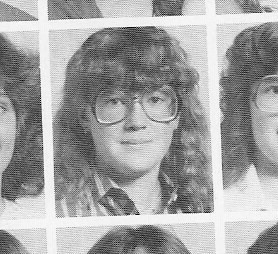 I know this post idea was mine, and so I feel compelled to let you know that my worst hair day ever looks very much like yours -- only I think a) it might have been my Senior yearbook photo (hence, had the added glory of color); and b) I though it was a GREAT hair day back then. Which only goes on the list of things that we didn't really know, but were very sure we did know, back when we were teenagers.